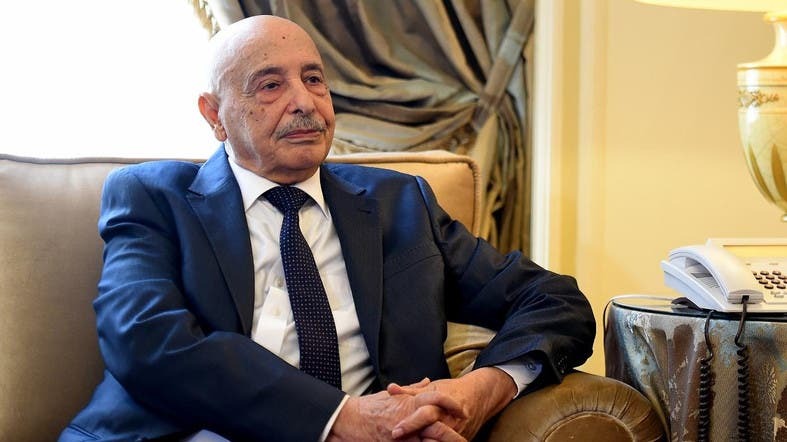 Libya's Aguila Saleh, speaker of the Tobruk-based House of Representatives, said on Saturday that the Libyan people will head to the polls after the capital Tripoli is liberated. He called on Libyans to stand by the Libyan National Army (LNA) led by Khalifa Haftar. Saleh’s statement came during a parliamentary session held in Benghazi in eastern Libya, which is under the control of Haftar’s forces. Saleh said: “We will be going to the polls after liberating Tripoli,” calling on the international community to protect Libya’s money and to lift the weapons embargo on the National Army. He also pointed out Libya’s keenness to cooperate with the international community to combat terrorism. “We need to get rid of militias and terrorist groups,” Saleh who is allied to Haftar, said using a reference eastern officials often make to describe forces allied to the Tripoli government, which relies on support from several armed groups. “We assure the residents of Tripoli that the campaign to liberate Tripoli will be limited and not violate any freedoms but restore security and fight terrorism,” Saleh told lawmakers in a session in Benghazi. But Serraj’s national accord government has managed to halt the advance for now, aided by forces with machine-guns on pickups and steel containers across the road into Tripoli. The Tripoli government says it has taken nearly 200 prisoners from Haftar’s forces, according to Reuters. The United Nations, which had hoped to organize a national conference this month bringing the rival eastern and western administrations together to organize an election, has called for a ceasefire. The United States, G7 bloc of wealthy nations and European Union have also urged the LNA to halt its offensive. Libya has been gripped by conflict and paralyzed by political deadlock since the overthrow of Muammar Gaddafi in 2011.